This is the easiest (and prettiest!) way to step up your entertaining game as these gorgeous frozen pieces of art will make all of your summer cocktails and cocktails that much more exciting! Hi Guys! I have something a little different than usual- this isn’t a recipe, but instead a really fun and easy (our favorite, right?!) lifestyle hack to make sure that you are blowing all of your friends and family away with minimal effort- always my goal. 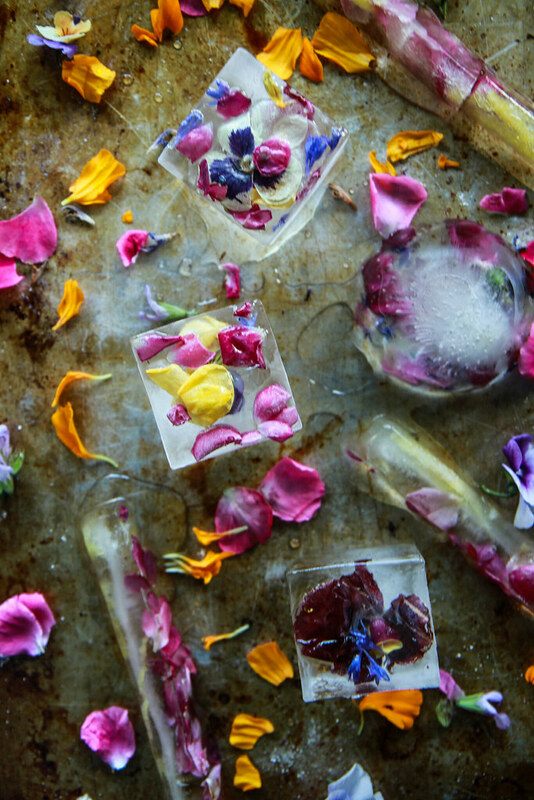 Truly, all you need is ice cube trays, edible flowers and water. Not so bad, right?! First lets address ice cube trays. Obviously there is your standard ice cube tray that almost everyone has in their freezer or lurking around in their laundry room. Just because they are standard doesn’t mean that they won’t make a mean set of eye-popping decorative ice cubes. However, there are other options! Silicone molds have really risen in popularity and while most often they are used for pastry confections, they also make a perfect ice cube mold. I personally love the really large cubes for Whiskey, Bourbon or tequila sipping. There are also really cool domes (half-spheres) or whole sphere ice cubes that are equally show-stopping. I also love long skinny ice cubes for serving drinks in champagne flutes and smaller cubes for mixed drinks. Really, the sky is your limit when it comes to shapes and sizes. Next (but SUPER important!) is making sure that your flowers are edible. Actually, thats critical! Please make sure you k now exactly what kind of flowers you are using (eating inedible flowers is very dangerous) and that they have not been sprayed with chemicals. Then it is as simple as placing the petals in the ice cube molds, covering them with water and popping them in the freezer. 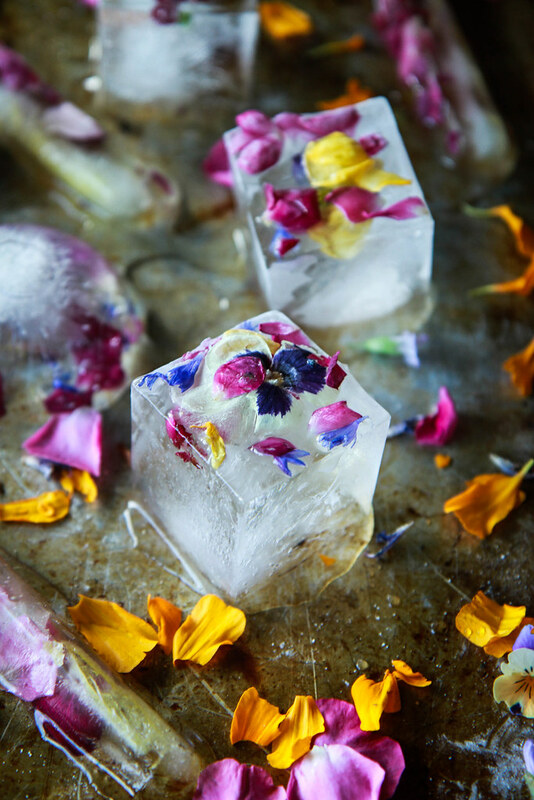 Wait at least a couple of hours and up to overnight and you have gorgeous edible flower ice cubes! I can’t wait to put these in every drink! SO pretty! These are so pretty, Heather! And I’m jealous that almost everything comes from your garden! You have a green thumb! I’m obsessed with edible flowers, so this just makes me want to make cocktails ASAP!! so fun! 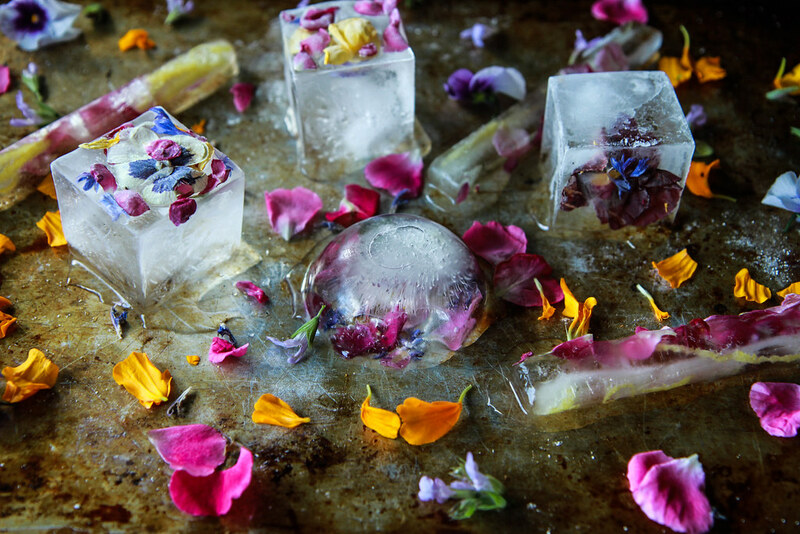 It’s so so pretty but actually easy to make this beautiful flower ice cubes.